The NordicTrack A.C.T. Commercial 10 elliptical is another model in NordicTrack’s mid-mech driven range with a center driven flywheel and a smaller footprint with just as much of a powerful workout. One of the best features of the NordicTrack A.C.T. 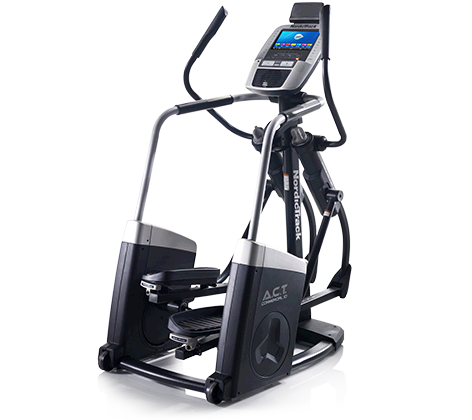 Commercial 10 elliptical is the massive 10 inch display with online capabilities allowing you to swipe through your workouts using the touchscreen, connect to your iFit® account and track your progress through Google Maps. This trainer boasts 24 resistance settings which can be adjusted easily using the SMR® Silent Magnetic Resistance options allowing for smooth and silent adjustments. There are also 35 workout applications and the display boasts HD video output to watch scenery go by or use the built in personal trainer to motivate you. Most reviewers are happy with their purchase of the NordicTrack A.C.T. Commercial 10 elliptical and are especially happy with the large 10 inch screen with the ability to track progress using Google Maps® allowing them to run anywhere in the world. This really is a fantastic feature and combined with HD makes the experience even better. Also the smaller footprint is a hit with because it can fit into a smaller space without the need to pack or fold it away each time you want to use it. 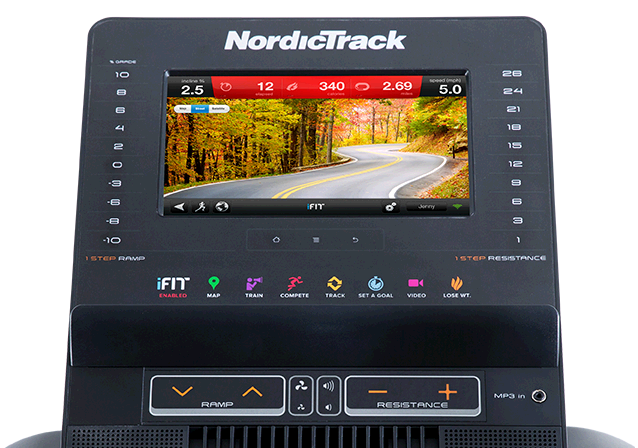 The great number of workouts gives the user the ability to vary their training and the IPOD® dock which is a pretty standard feature on NordicTrack’s ellipticals gives it a personalized feel. The integrated personal trainer in HD is also a great hit in the reviews. You can save a couple of hundred and opt for the ACT 7 elliptical trainer, which has a 7 inch screen rather than the 10 inch. The display size is the only difference between the two ellipticals. Or, if you don't need/want the touchscreen, the base ACT Commercial model is a nice choice as well, although it has a few less workouts and less of a warranty. The NordicTrack A.C.T. Commercial 10 elliptical is a great piece of equipment and has a huge amount of features that are too many to really go into detail. In particular we love the 10 inch display with full HD display giving the user a feeling that they are using a top of the range trainer from an expensive health club. Although our only concern is that the many features can become redundant for anyone who is not particularly tech savvy and will be paying over the budget for what they will use and need....but at $1500 on sale even if you don't use half of the features it is well worth it. NordicTrack ellipticals are on sale right now!